This is a story that I've been holding on to for two years now. Waiting on that perfect line to tell my story of Nico on the Astro Orbiter in Disneyworld. And lo and behold, October Afternoon comes out with one of the best boy lines ever - Rocket Age! I love every single sheet of paper and embellishment in this line. I have a huge pile in my stash and I recently dug in. I took these pictures while on the ride with him, so all I had were these close-up detailed shots. They told my story though - of how it felt to soar on a rocket looking over all of Tommorowland with my boy. 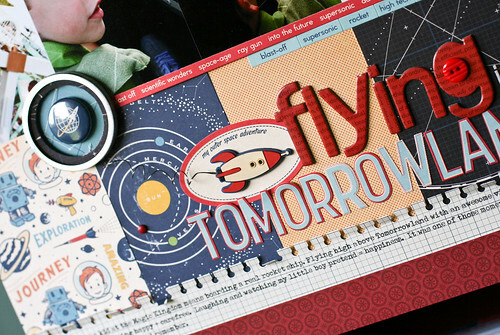 The different space patterns and rocket embellishments give the layout the feel I was looking for. 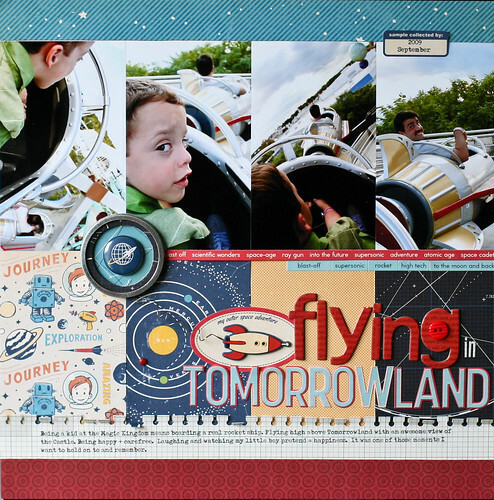 I made the frame for the button with an old Making Memories metal tag and a chipboard circle. I then attached it to the rocket with a thin strip of wire. It visually connects the title to the photos. This was a fun and easy layout to put together. For a complete list of the products I used, click here. It's way too hot out now, so that means more indoor/scrapping time! Be back soon with another new project. I'm still here. Enjoying the summer season and hosting the longest sleepover ever. My niece and nephew have been with us for 2 weeks and we've been everywhere! I'm exhausted, beyond tired, but happy. In my "spare" time I stayed up way past midnight to work on some CHA projects for Pink Paislee last week. This is their new Halloween line Phantom, which was perfect for pictures of Nico at the Haunted Mansion two years ago. I love the big polka dot paper with its faint grid background. 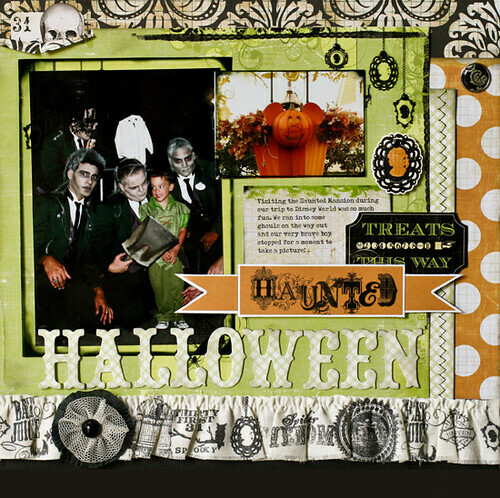 I used the plain Mistables fabric border and stamped coordinating images with Staz-On ink. I really like the custom look that it adds to the page. Here is a closeup of some of the die cuts and clear frames from the line. I added some pop dots here and there for dimension and some stitching for a pop of black. 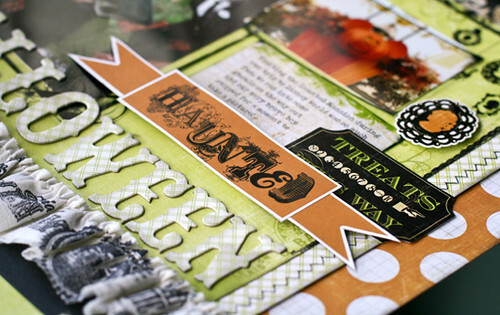 Here is a close up of my page using the Vintage Melrose line by Pink Paislee. The aqua flower is a pre-made embellishment and I added the wooden button (also from the line) and black ribbons. One of my favorite products from Pink Paislee are these new wood letters. I added some pink paint and then sponged them with light grey ink to match the page. 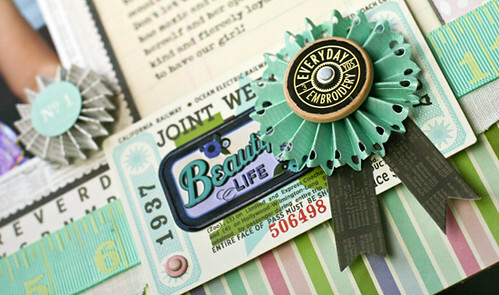 I love that the colors are vintage with just enough of a modern twist.